Telegraph file photo by DEAN SHALHOUP Yankee Magazine publisher Jamie Trowbridge gets a laugh out of Gov. 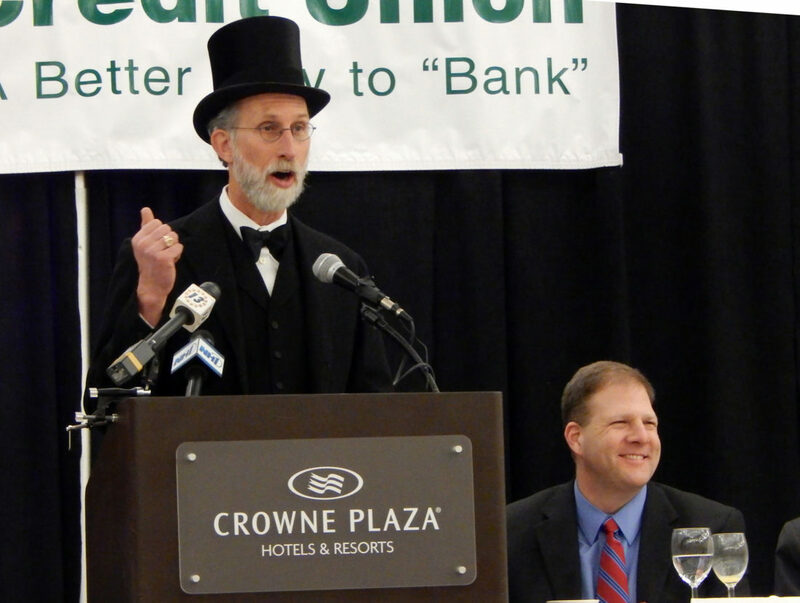 Chris Sununu at the 2017 Salvation Army Groundhog Breakfast. Both "Yankee wits" are on the speaking program for this year's 19th annual event Feb. 1. Every time I start thinking about the Salvation Army’s annual Groundhog Breakfast, which seems to happen right around this time of year for some reason, one of my favorite groundhog-related anecdotes pops to mind. Mentioning ­ well, perhaps more like grousing ­ to someone or a couple someones that come Feb. 2, in whatever year it was, I would be faced with the task of dragging myself out of bed in the dark, pre-dawn chill, then feigning a bright-eyed and bushy-tailed look for at least the next two hours. “Why?” at least one of them inevitably asked. “Gotta go to a breakfast … a groundhog breakfast,” I responded, evidently conjuring up a vision in their minds of one of those wild-game feasts hunters have every now and then to share their bounty and swap stories of the previous hunting season. “Wait. You’re getting up early to go to a breakfast … groundhog … what?” I distinctly remember one of the more animated members of my little audience asking me. The lightbulb clicked on. I had an idea. “Yeah, I went to my first one last year,” I sort-of fibbed. “They told me it looks something like chicken, only darker. Cooked, it’s not as tender as a good beefsteak, a tad chewy, but sliced thin it’s surprisingly tasty,” I totally fibbed. “And besides, it’s all for a great cause.” That part is true. Oddly, my little audience walked away without asking me where they could buy a ticket to this most special breakfast. OK, no, grilled (or baked or fried or slow-cooked) groundhog is not plated up and served to members of the usually sold-out crowd that flocks to the Salvation Army’s Groundhog Breakfast each Groundhog Day. But before telling people how much fun the Salvation Army’s signature fundraiser is, and how much its proceeds help sustain the agency’s programs ­ especially its Summer Camp program ­ I sometimes get a kick out of seeing how convincing I can be pretending a roomful of folks dine on groundhog every Groundhog Day. Just around the corner, once we say good riddance to this cold, so far virtually snowless January, is the 19th annual version of this unique fundraiser, which takes place either on, or on the closest weekday to, Groundhog Day itself. That Feb. 2 is Saturday, the breakfast is the day before the official Groundhog Day; for the details on time and tickets and so forth, see the accompanying information box. Salvation Army development director Amie Groff tells me Triangle Credit Union is once again the main sponsor ­ called the Top Hat sponsor ­ and there’s still time for additional sponsors, be it a business, organization or individual, to sign up. There’s still room left in the program for a few more ads, she said, and organizers are gratefully accepting items for the silent auction. There’s also a live auction, and it’s a key part of the event because all of its proceeds are earmarked for Summer Camp scholarships, which, for many of the children who benefit so much from attending the camp, are the only way they are able to afford it. The fact that Jamie Trowbridge, he of Yankee Magazine fame who for years has brought “New Hampshire Wit and Wisdom” to the table, is on again this year should by itself sell a bunch of tickets. A highlight of the program will be the announcement of the Salvation Army’s annual Citizen of the Year, an honor that recognizes someone who has, and continues to, go above and beyond in their volunteer or leadership service to the agency, as well as the community in general. And of course there’s a highlight of another kind that patrons can bank on: The appearance of everyone’s favorite groundhogs, Pennichuck Chuck and his wife, Penni Chuck. The silent, but always smiling, couple met, courted and married at Groundhog Breakfasts over the years, and were the center of attention the year they announced they were becoming husband and wife. “They’re always willing to pose for photos,” Groff said. Indeed, why let those bright, buck-tooth smiles go to waste? WHEN: Friday, Feb. 1, 7-8:30 a.m.
WHERE:DoubleTree by Hilton Nashua (formerly Crowne Plaza Hotel), 2 Somerset Parkway, Nashua.